The Isotech Slide Shaft was developed to achieve greater accuracy in roundness, cylindricity, surface finishing, and linear travel. Heat treated in both axial and radial directions, Isotech’s Linear Slide Shafts come in both high-carbon chromium bearing steel or Martensite stainless steel for maximum performance quality. In addition, our precision machining capabilities offer you a variety of specially engineered custom shafts, such as spindle and roll shafts, to meet your special requirement. Isotech Slide Shafts feature reliable, high precision roundness cylindricity, straightness, and surface finish. 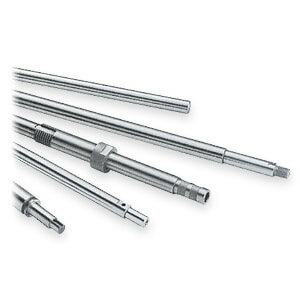 Isotech Slide Shafts are annealed, quenched and tempered by processing techniques and skills developed by . The heat treatment assures the Slide Shafts uniform hardness in both radial and axial directions, developing an appropriate layer. The Martensite stainless steel (SUS 440C) is also subjected to a sophisticated heat treatment to suppress distortion, assuring a uniform hardened layer and sufficient hardness.